KIEV, Ukraine -- The first 2,000 recruits of a new Ukrainian police force fanned throughout the capital Kiev over the weekend, intended by the government as a visible sign of its commitment to shake off a deep-rooted culture of corruption in public institutions. 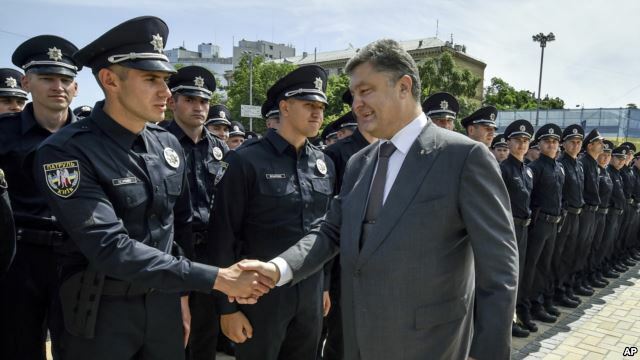 Ukrainian President Petro Poroshenko greets police officers at a swearing-in ceremony in Kiev, Ukraine, July 4, 2015. Trained by U.S. and Canadian forces, and given less militaristic uniforms and the name 'Politsiya' to mark a break with the old, Soviet-style 'Militsiya', the young officers pledged to forsake the bribes associated with their job. President Petro Poroshenko told the force, which will first patrol big towns and then be deployed across the country, that it was their task not only to uphold the law but "also to make people believe that reforms are inevitable." It was perhaps the most visible break with Ukraine's Soviet past since pro-Moscow president Viktor Yanukovych was ousted in February last year by the "Maidan" protests against corruption and in favor of closer ties with Western Europe. But the new force, whose navy blue uniforms and caps would not look out of place on the streets of New York, will have its work cut out in a society where police and courts are widely seen as favoring the powerful, and bribes are used for everything from avoiding speeding penalties to getting into good schools. In a poll released last month by the Razumkov Center, an independent research group, respondents scored the progress of reforms at only two or three out of 10. Almost 81 percent thought the fight against corruption was not working. "I want to believe it," said Natalia, a middle-aged woman who did not want to give her last name, after watching the new recruits stand at attention to be addressed by Poroshenko. "I hope, deep in my soul, that something will change for the better." Another onlooker, Serhiy Makarchuk, said he hoped there would be no more bribery, "and that there will be order, so that they won't be drinking alcohol on the streets." Ukraine's battle against corruption has had a few false starts: the bill regulating the new police force has yet to be signed by the president after months of wrangling in parliament. For now, they must adhere to the old law. A much-vaunted Anti-Corruption Bureau, charged with weeding out high-level corruption, was finally set up in April after six months of discussions, while some ministers are still struggling with the definition of graft. Last week, the minister for ecology and natural resources, Ihor Shevchenko, was dismissed after accepting a lift on a businessman's private jet from the French resort town of Nice to Kiev. Shevchenko said he had paid $1,000 for the trip, and that he did not see any evidence of corruption. For Dmytro Korchynsky, who fought during the "Maidan" and formed the St Mary's Christian volunteer battalion, which is helping Kiev's forces fight pro-Russian rebels in the east, the new government has done little to fulfil the demands of the protests. "The majority of the Ukrainian people, I think, are pretty poor," he told Reuters. "That Yanukovych stole from the country is bad enough, but these people are stealing from a country at war, [which] is even worse. This is just looting."